We saw part of this video on tv this morning. I liked it even better the second time. Not only are the boys cute, but the song is fun. Check it out. I’ve given up trying to get the email of postings to work on the other site so making the big switch to this new blog site. Bear with me as I work out the kinks. After a short discussion on Boston traffic it was decided the merits of heading into Boston in the evening outweighed an early hotel. 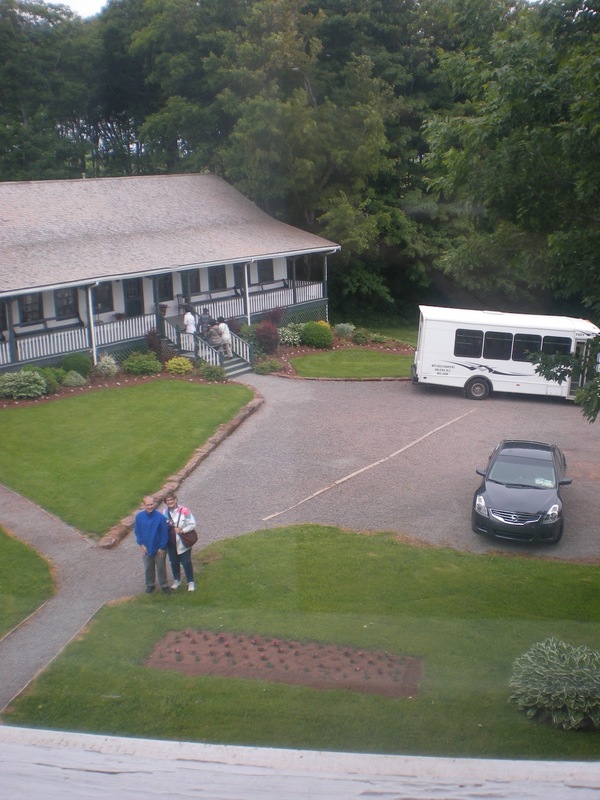 We found a hotel located just outside of Plymouth and decided it would fit into our schedule of one more fun thing we could pack in. So after a quick stop at the Ocean Spray cranberry bog we headed into town to find the most famous Plymouth Rock. I’ll have to tell you the rock was a bit of a letdown. Rebecca had read up on it and explained that way back there was discussion whether this particular rock was the actual spot of the Pilgrims landing. 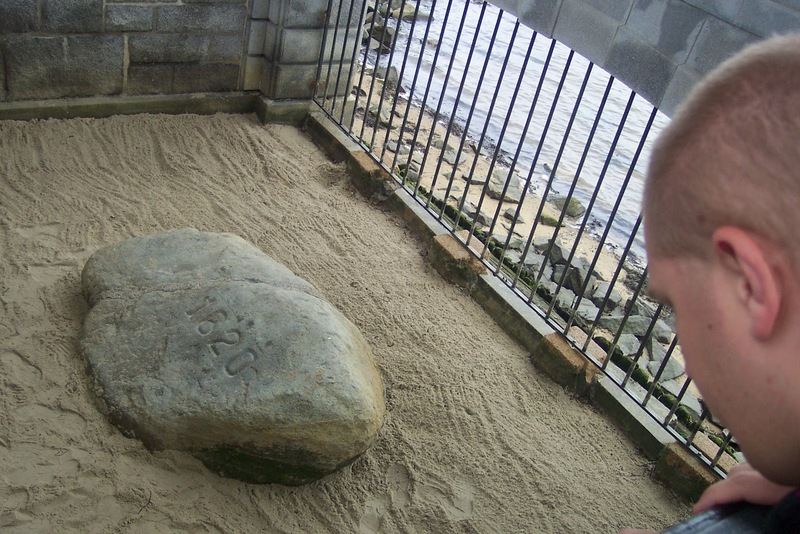 The people of the time decided it should be and wanted to move the rock to a protected area. While moving it it got broke. But some good super glue put it back together and the townspeople put it on display at the beach. Hmmm… I’m sharing a picture so you, too can be impressed. Mayflower II, bigger than I expected. 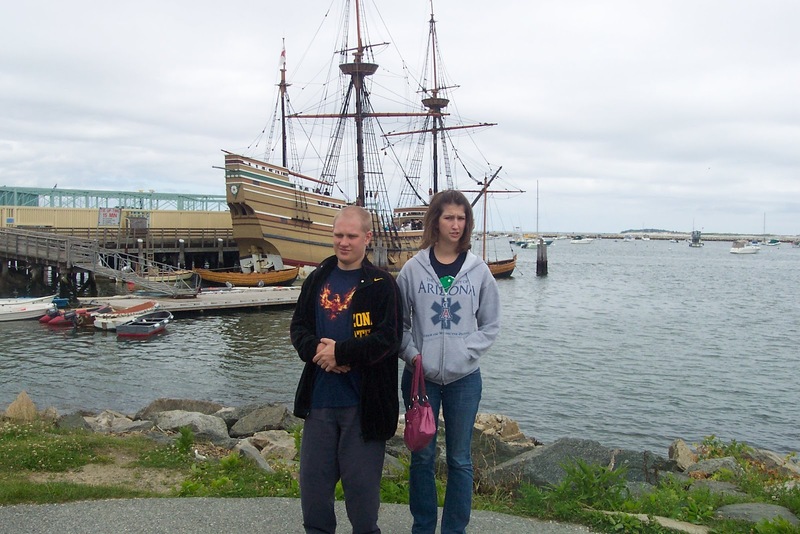 Next to the famous rock was the Mayflower II, a replica of the original sailing ship. We then walked through town to the oldest street in America on which was the oldest house. The street was paved and all that was left of the house was a marker. My take, Plymouth has an interesting heritage but not much of the original events remain. Then back to Boston. The day was absolutely beautiful and after some instructions from our hotel staff we managed to find the subway and ride in to town. (This GPS continues to vex me and I was most willing not to have to navigate.) The Freedom Trail starts at the Boston Commons Park. A beautiful tree filled park that also was filled with kids touring just like us. Maybe it’s the end of school field trips? 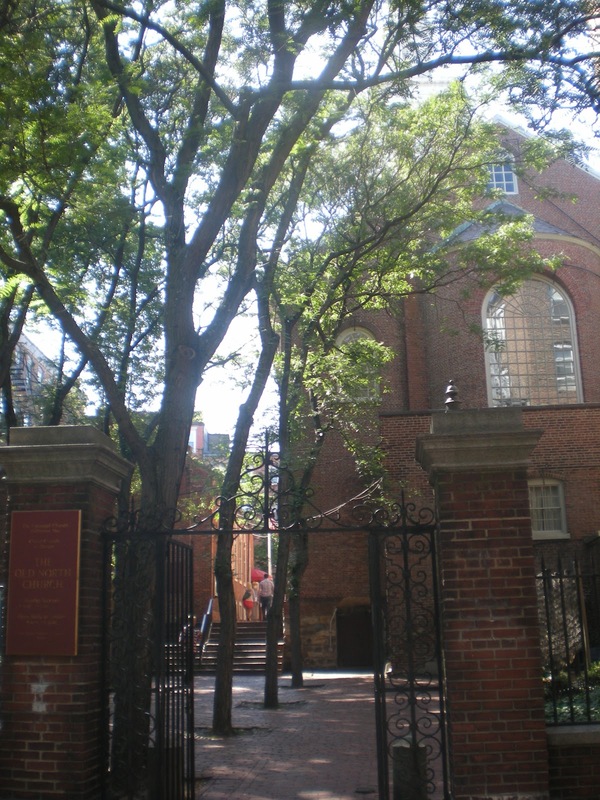 The Freedom Trail is a marked pathway that leads to many historical buildings and landmarks of the Revolutionary time. Everything you learned in school comes to life. There are several statues of the heroes of the era. Patrick Henry was one of my favorites. Do you know that people were so upset about the British tax situation (sugar and tea) that they packed over 5,000 into one of their meeting halls? They must have come from miles around to attend the events. The patriots knew that by speaking out they risked the wrath of the king; still they did it. On the side it says: A Statesman; Incorruptible and Fearless. Downtown Boston is a crazy mixture of old and new. Skyscrapers are next to brick buildings built in the 1700’s; wide roads move traffic on one block but the next intersection narrows back to a cobblestone path. Along the trail are many restaurants filled with wide open windows to the street. It would be easy to do some taste testing as you walk along. They tell you that the trail walk is just over two miles one way. But stopping to look at each building, statue and house (like Paul Revere’s) really adds to your time. We also were distracted by some fun street dancers who were set up in one plaza entertaining the crowds. It took us the whole afternoon and we surely could have spent more time just soaking it all in. One thing that really surprised us is that many of the exhibits, including cemeteries were closed before 5pm. And, as Rebecca just reminded me, we were disappointed that many of the buildings charged a small fee. The walk itself is free but if you want to visit say, Paul Revere’s house or the Old North Church it will cost. Still, we’d rather see the history preserved so when you go don’t be a cheap skate. And that concludes our trip. Some people ask why we try to pack so much in to one visit. The reason is because I think it gives us a good sampling of the area. We may not make it back but if we do we’ll know what areas we really liked and be able to focus on them. Tomorrow is another flying day. We are hoping for a much easier trip this time around. Since I already whined about our breakfast deal yesterday, I’ll save you the pain of hearing it again. I wish the TSA agents at the airport could be trained by the Border agent we had this morning. He quizzed us thoroughly, looked at everyone and then let us through. TSA would do well to profile for bad guys rather than assuming all fliers are bad… but no politics today. Bob’s Father’s Day present was a very nice policeman not giving him a ticket. Ha. Talk about raising your blood pressure. We were driving along a lovely stretch of countryside, just minding our own business when an unmarked police car pulled us over. Apparently, Bob might have been going a little fast. But the officer said it was possible that his radar gun was off and that Bob really wasn’t driving as fast as it said…and since it was Father’s Day he just wished us safe travels. Whew. 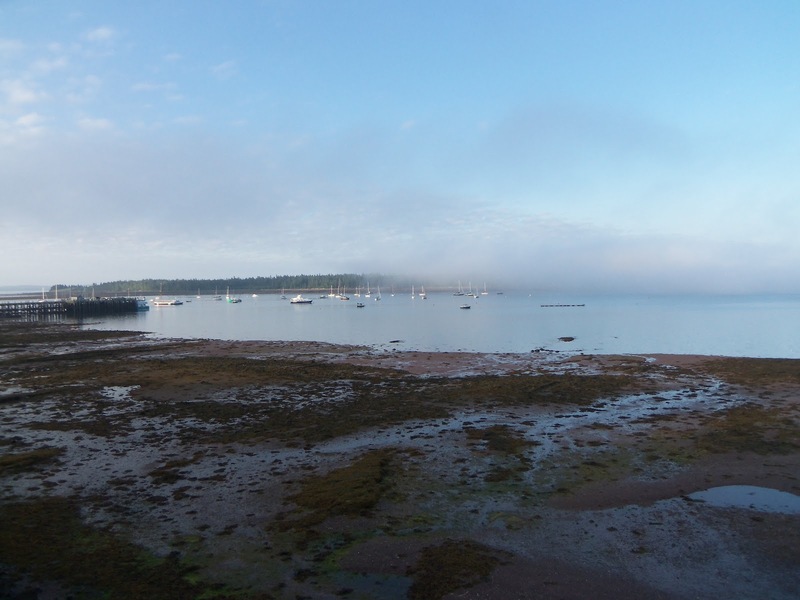 The shore of coastal Maine is just as pretty as you imagine. Of course, it helped that it was a picture book day. Just a bit of fog firs thing and then beautiful blue sky. We realized as we’re snapping tons of pictures that we focus on limited things: water-ocean, lakes, rivers, rain; flowers-all those wild roses and lupine and then close ups of all the same flowers; and each other-how lame we are taking pictures of each other taking pictures… But, back to the countryside. Lots and lots of two or three story homes many built in the late 1800’s (some earlier, but not like VT where we found many built in the late 1700’s), generally with well-manicured yards. I think a Sears-siding salesman could keep very busy up here. Much as Rebecca wanted, we were not able to drive the coast road the entire way. It would be a fun vacation, just by itself. There is an elevator that goes all the way to to the top of this tower in less than 50 seconds. 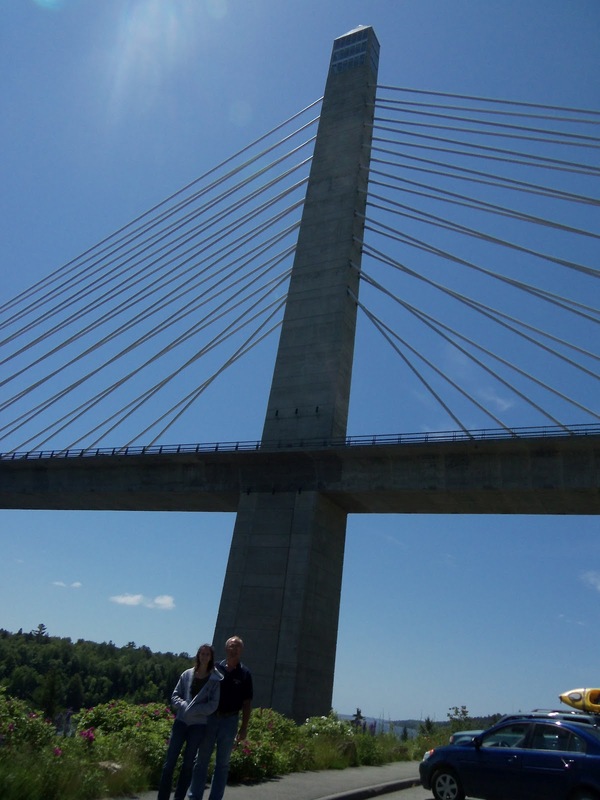 We did find a giant fort to explore at Bucksport by the Penobscot River. We have seen many forts across the country but this one is in amazing shape and absolutely huge. (As I write this they are arguing when it was built… I’ll check for you.) It was fun to walk through. Next to the fort were two giant bridges over the river, an old rusty one, no longer in use and a fancy brand new one with an observation deck in one of the towers. As we discussed visiting the observation deck Matthew and I heard that it was 400 feet. 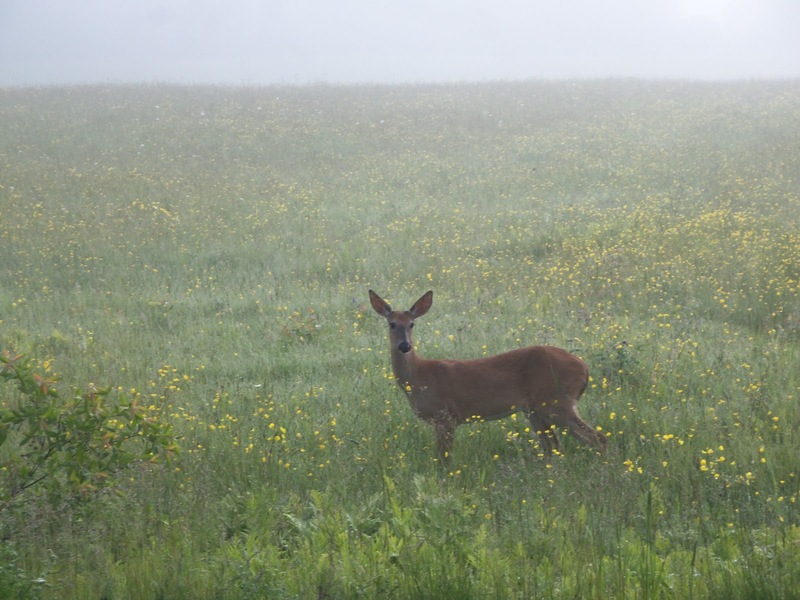 He and I decided it would be much more pleasant if we waited down near the wild roses while Bob and Rebecca rode the supersonic elevator to the top. They told me they took pictures… I’ll see if I can find one. Ready for a quick shopping spree! 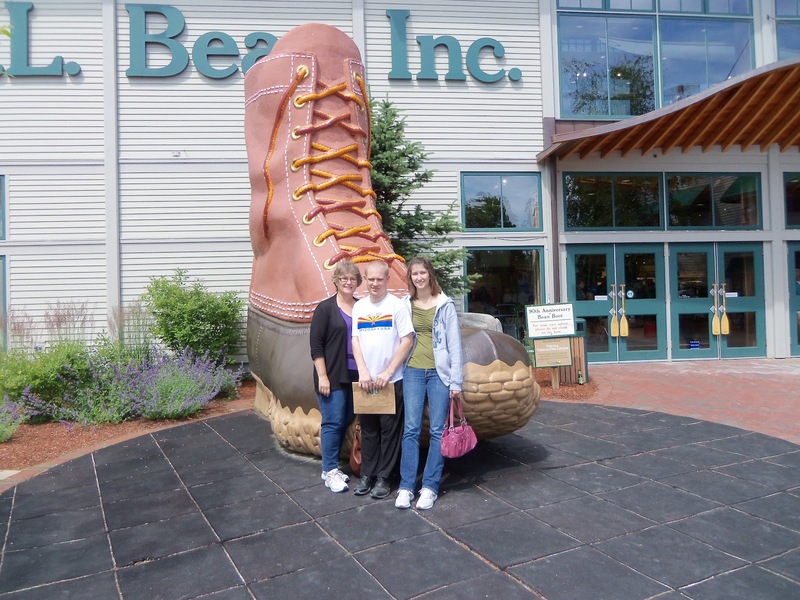 Of course, no trip to Maine would be complete without a trip to LL Bean. We found their store…or should I say giant complex in Freeport and took a quick run through. Much as I’d like to, we didn’t spend the rest of the day shopping there. I love that store! Okay, here’s your tip for today. Maine became a state in 1820. So it is not one of the 13 colonies. But you knew that. Oh, and everywhere we went there were ‘Don’t Tread on Me’ flags and posters. Definitely leaning towards Libertarian. That’s about it for the day. 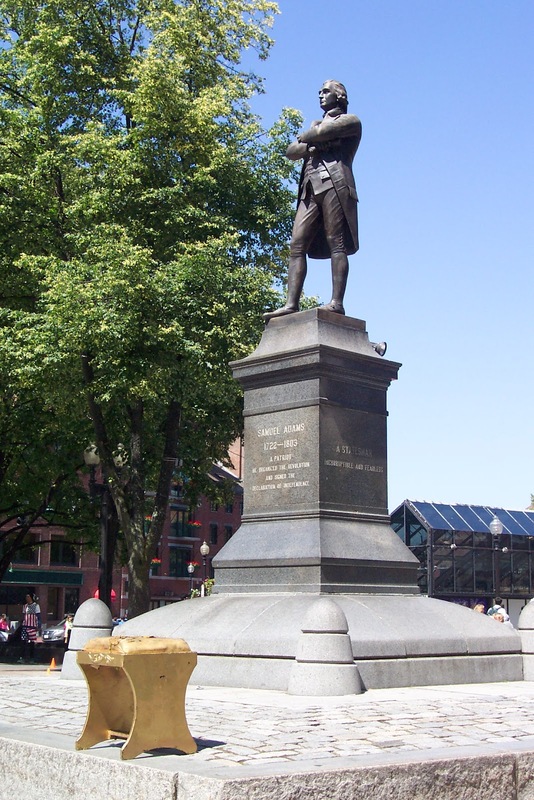 Tomorrow we will be back in Boston and going on the Freedom Trail. No rain in the forecast. Today was dedicated to tide watching. 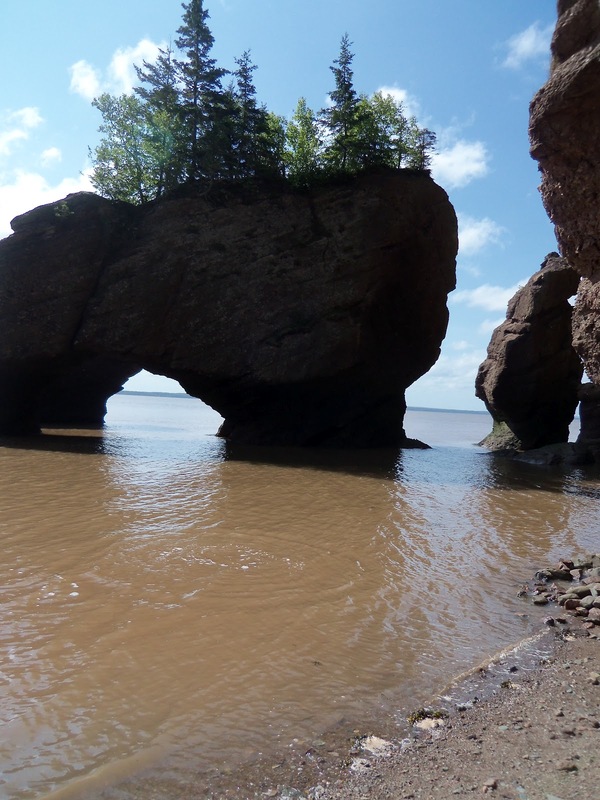 New Brunswick borders the Bay of Fundy, home of the highest tides in the world. The town we stayed in, Moncton, is on a river at the very head of the bay so this morning as we headed out we could see how high (and low) the tide was as it changes the river height even some 30 miles from the bay. Nearly high tide. At low tide you can play under the rock. As we headed further south we decided to stop and see the lighthouse at Cape Enrage. It was well off the beaten path up the hills, around the mountain and through the woods. We got to the pretty bay and almost stopped thinking we’d spent enough time but decided to head around one more corner hoping for the lighthouse. We found Cape Enrage. Lucky for us. The view was absolutely amazing, we could see from high the water racing out for low tide. When we drove up to the pay station we were told that today was a special day. No charge. The Premiere was coming to visit. They welcomed us as if we were part of the party. We got out of the car and one gal grabbed the camera so we could have our picture, a few minutes later another one did the same…a different shot of the lighthouse. They were all in a very celebratory mood. They had a new Zip Line set up and apparently the Premiere was planning to ride it. Bob and Rebecca, thinking they were also dignitaries, wanted to ride it too. I really couldn’t believe when they came out all set to race across the sky, tethered only to a thin, thin wire. (I asked Bob if he told them his true weight…for heaven sakes…) Off they bravely went and soon zipped out of the trees over to the lighthouse. They said they had fun. Matthew and I had fun watching them. We decided not to wait for the Premiere though it would have been fun to meet him…or her… Our lack of Canadian knowledge is becoming apparent. 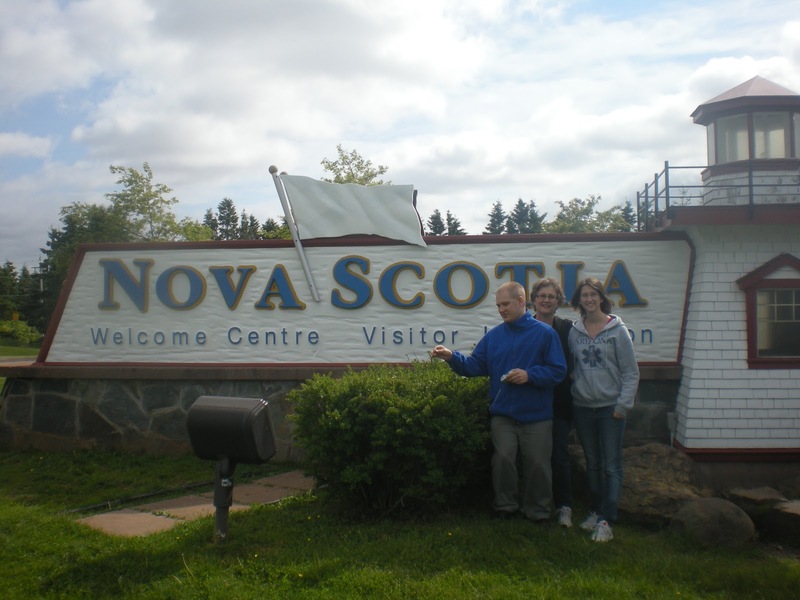 The next stop was at Saint John which apparently is the only city on the bay. We got there just in time to watch the tide rushing back in pushing up against the river. The whirlpools looked so strong. It was a major battle between the river and the ocean. Back and forth as they win for a few minutes then give way and then back again. Sad to report we haven’t seen one moose. Berries are just starting to grow. Bob asked a kid who was eating his lunch and had a big bowl of beautiful raspberries if he had just picked them. The kid was compelled to tell the truth, that he had bought them at Costco. Our last stop for the day was at the beautiful little coastal town of St. Andrews. Our hotel was on the bay and we thoroughly enjoyed sitting on the little balcony watching the tide roll in and out. This town is at the mouth of the Bay of Funday. It also experienced similar high tides but without the force and current we saw to the north. It was interesting that the sail boats anchored in the harbor all tilted as the keels touched bottom during low tide. Bob and I sat outside in the morning drinking our coffee thinking this was a pretty much perfect way to relax. St. Andrews with tide heading out. 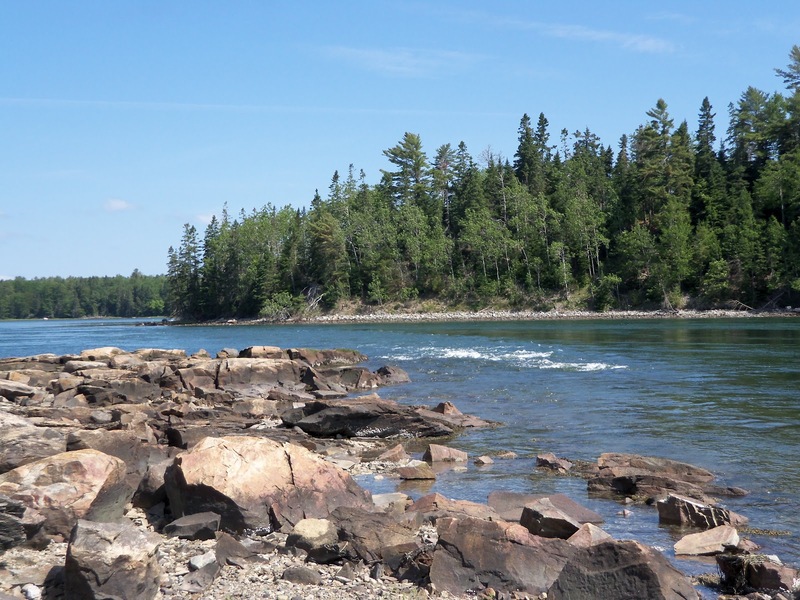 Tomorrow Down East in Maine and back to civilization. 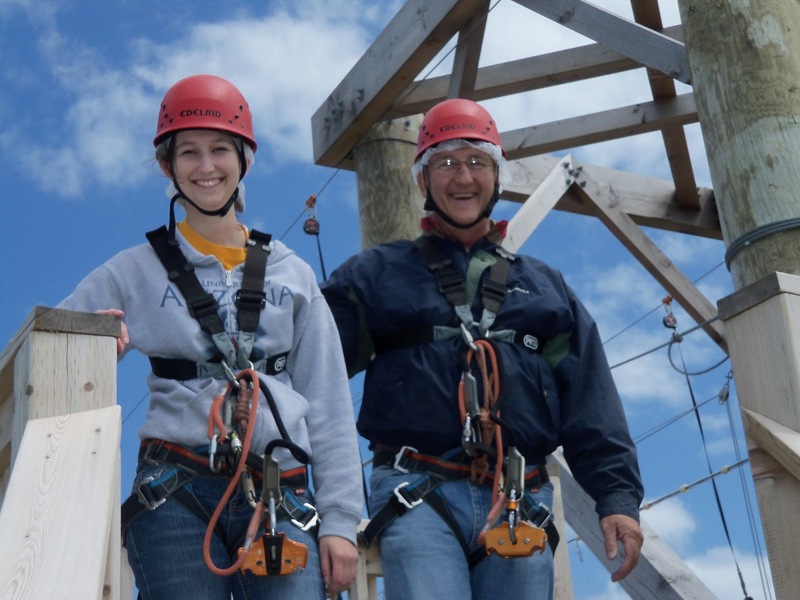 Some of the Group Try Zip Lining! Rebecca and Bob had lots of fun today! This is Rebecca. I didn’t realize she had started …but if you listen closely and turn up the volume you can hear her screaming at the beginning. The second one is Bob… both are crazy. 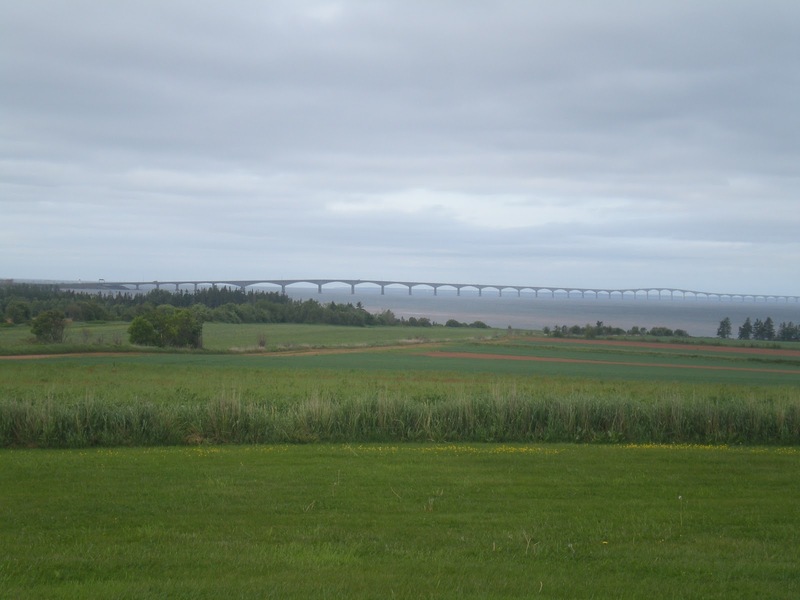 Looking back at the Confederation Bridge. 10 miles of scariness. 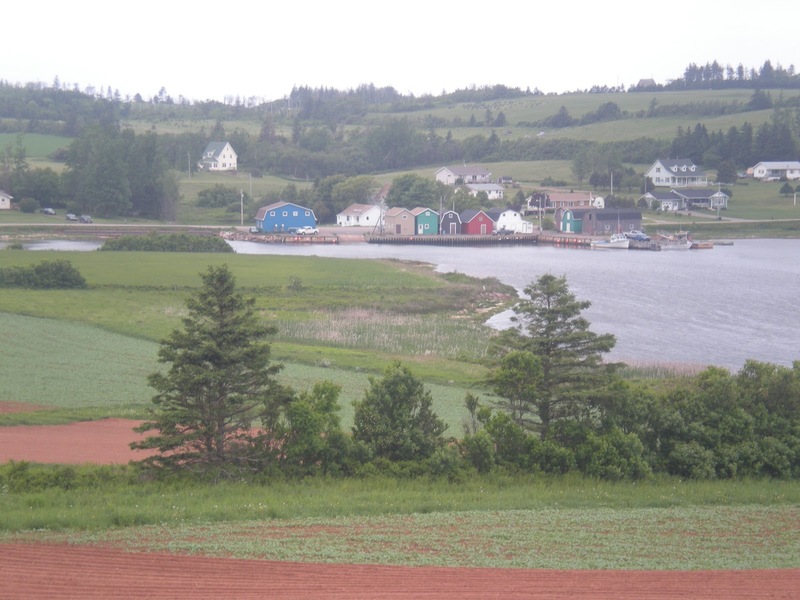 Freshly planted fields on PEI. Oyster beds are just to the right in the bay. There is no way our pictures can do this beautiful island justice. It’s a patchwork quilt of little farms and rolling hills. And at the edge of the island the land suddenly cuts away to red clay cliffs into the ocean. They grow lots of potatoes and hay and we saw many cows. In the bays there were oyster farms. Interestingly, most of the gardens appeared just recently planted. That reminds me; we discovered that up here it is not yet summer. Kids are still in school and while everything was open we were just on the cusp of their tourism season. So there were no crowds anywhere. The people told us that “in summer” all the streets and beaches were filled. Hey, there we are, looking up at a kindred spirit in Anne’s bedroom. For you Green Gables fans we found the Lake of Shining Water and visited one of the many museums dedicated to Anne and the author Lucy Maud Montgomery. Anne, of course, was a fictional character but the towns embrace her as their heroine. We could just imagine the little orphan Anne’s first impressions of ‘Avonlea’. The people we interacted with were all just as friendly as we would expect to find in the books. It’s easy to imagine finding kindred spirits. Oh, I have to tell you about the museum we visited. It was filled with period pieces from the early 1900’s. That was interesting and all but there was a group of Japanese women touring ahead of us. Pamelasan gave them a very animated explanation of each room. The ladies were so intent, inspecting everything, touching every picture oohing and ahhing. Matthew and I had to leave half way through for the bathroom (which turned out to be filled with Japanese ladies who I don’t think like to close the toilet stall doors) so Bob and Rebecca waited for our return. As they were in one room a group a Japanese women came through and Bob thought they were so taken that they were touring again. But no, it was another bus load. There must have been 100 Japanese woman, 1 Japanese man and us touring at that time. A real highlight of the day came when we found a British fish and chips restaurant that offered gluten free fried meal. No extra charge even! 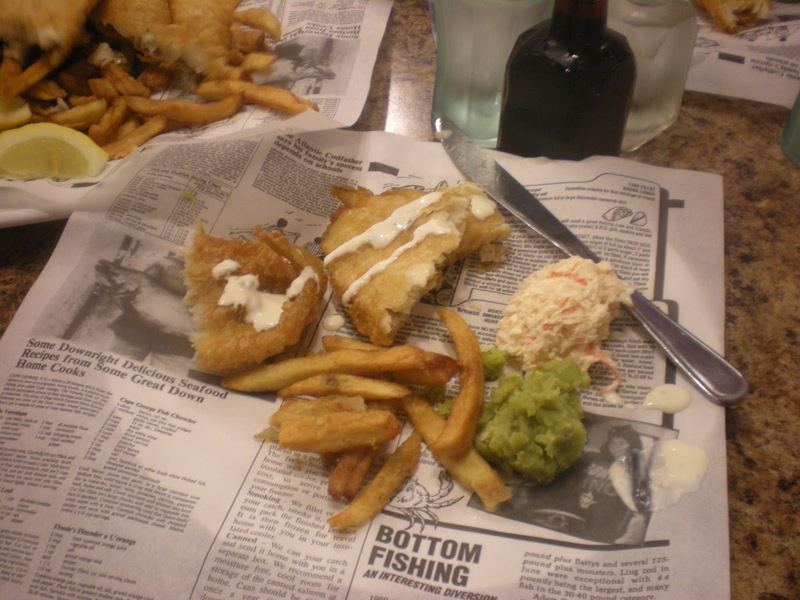 We ordered family style, an assortment of fried fish and then decided to try mashed peas just the fun of it. The fish was absolutely delicious. Matthew was so happy to be able to eat it, he loved it! The mashed peas were another story. They tasted like someone took dried peas, cooked them most of the way, then mashed them. No salt, no butter, nothing to give them any zip, except the chunky uncooked pieces… Those Brits, not very imaginative, at least with their peas. Matthew’s first plate. Yum…well, except for those peas. Before heading back to the hotel we visited the remnants of a pre-revolutionary fort. It was built by the English, taken over by the French and then retaken by the Brits. We also learned about the Acadians, who are not local Native Americans (or First Nation people, as they are called here). But the Acadians were pilgrims who landed in this area, figured out how to work the delta lands and then were deported during all that fighting. Many ended up in Louisiana—you know their relatives, the Cajuns. Oh, now it all makes sense, doesn’t it? Acadians—Cajuns…even sounds similar. I remembered from history that the Cajuns were French settlers now we know where they originated. We’re going to have to read up on them now. Here’s my observation for the day. It seems legal for people to ride their ATV’s across the freeways. Yes, interstate big divided highways. We watched some riding in the median just zooming along and others waiting to cross the road headed to a trail on the far side. I also saw a sign indicating the same for snow mobile crossing. Rules are not the same here. So, when you’re in Canada what do you call Canadian bacon? I don’t actually have the answer. But we did find a pizza place where we could get Hawaiian pizza and it was topped with Canadian Ham. In any case, Matthew again got a delicious gluten free meal. I don’t think Canadians are especially more aware of Celiac’s but maybe they are. Maybe it’s more prevalent here. Several of the gf foods we use are made in Canada. More than enough for one day. 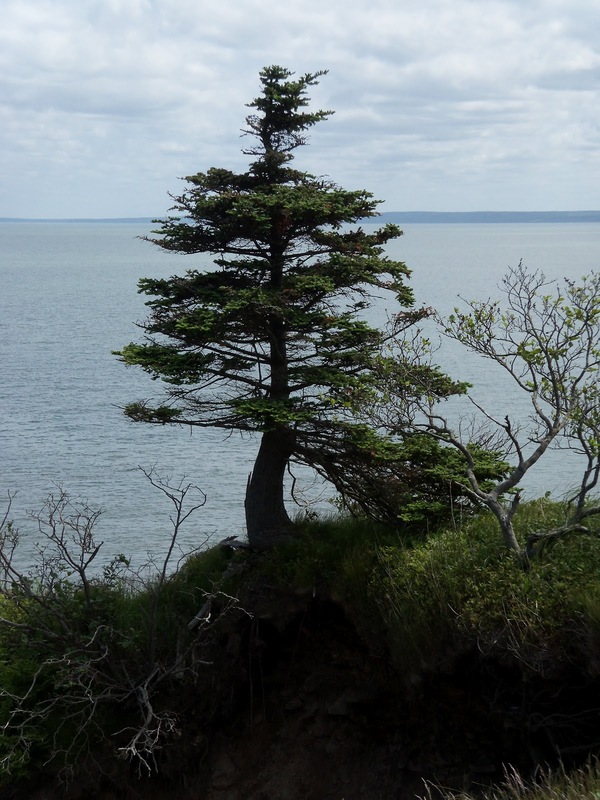 Tomorrow we are spending the day along the coast and hopefully will see the super high tides of the Bay of Fundy.